Okay y'all! The University of Texas campus is simply stunning! 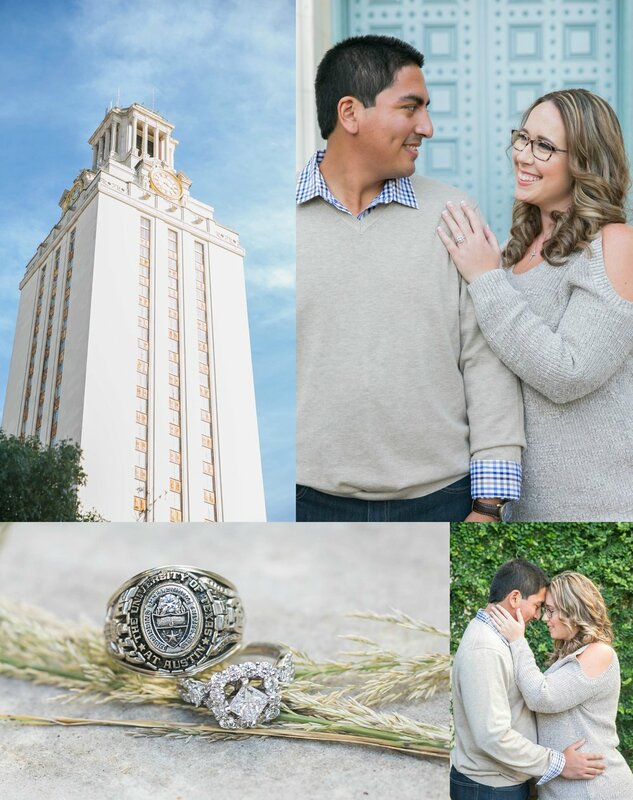 The day of our Engagement session, it was a bit on the chilly side, but my goodness, the sun was shining bright & highlighted the campus in the most beautiful way possible - the grass cut to perfection and the architecture had me in awe, looking up and gawking in a mesmerizing stare. Insert Rebekah & her fiance, Chris and let me tell you-magic! These two just portray goodness all around with the warmth of their smiles and their fun personalities. 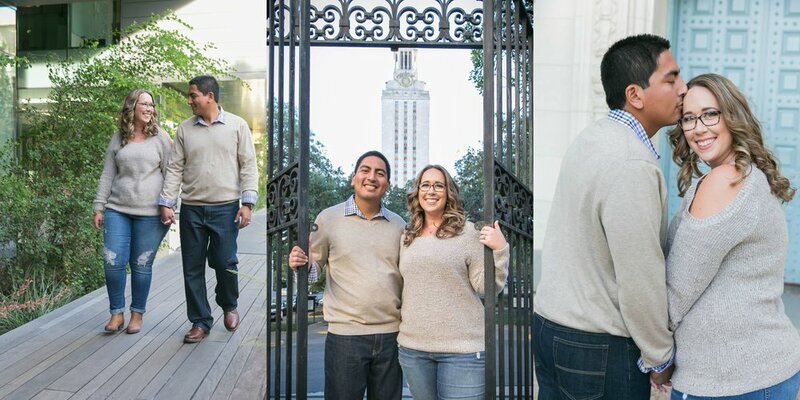 As I got to know them a bit more throughout our session, I could just tell-they are perfect for each other! They've been together for a little over seven years y'all, so you already know their wedding will be the celebration of the century with their closest friends and family in April! I asked them how they met and their answers weren't too far off from one another. This is a story of love at first sight-they make me believe it's a real thing! Rebekah: "Chris and I met at a college frat party on September 3rd 2010. I was a junior to his freshman and I always said Id NEVER date a frat guy but he was different. He actually walked my best friend and I out of this party holding my hand the entire time and nervously asking for my number at the very end. We went on one official date where he thought he was doing good by ordering my favorite dessert, carrot cake, but it had nuts in it which I didn't care for so he took a fork and picked out all the nuts for me!!! On September 16th 2010 he asked me to be his girlfriend outside the nursing school building and its been a beautiful yet sometimes messy road ever since!" Chris: "We were both attending UT Austin and we met at a frat party. I was hanging out with friends and suddenly saw her walk into the party. I mustered up the courage to talk to her and am very thankful that I got to meet her that day! This might sound like a cliché, but I knew that I liked her from the moment I first saw her." Rebekah: "Chris' patience and genuine kindness is by far what makes me fall in love with him over and over again. He is never in a rush or anxious (which can sometimes be frustrating) but to me, the one who is always rushing, he calms me. His kindness to everyone, not just those he knows is so refreshing. It's almost like going back to when we were kids and no one was a stranger and no one had ulterior motives. We just smiled and played and everyone was a friend- that is Chris! He is actually younger than me, but he helps make 'adulting' not as scary as the world makes it." Chris: "he best thing that I like about Rebekah is that she is very compassionate towards others. She is always willing to lend out a helping hand and is very thoughtful. She makes me a better person and is a beautiful woman inside and out." I could tell what they liked about each other, because we all gravitate towards certain qualities that outwardly portray genuine goodness and I absolutely enjoyed Rebekah's joyful poise & I greatly appreciated Chris' patient disposition throughout our session. If the sun would've allowed, I would've just continued walking with them and taking photos without looking at the time, because I had a great time. time flies when you're having fun & our time went fast-these two are simply a breath of fresh air to be around! If you are blessed to know these two personally, I'm sure you're reading this with an understanding smile because you get the same feeling being around these two as I did. This time being engaged is extraordinary, and I'm positive their wedding day will be absolutely perfect. I had to ask if after they were married, they were planning on starting a family right away or taking it easy for a while as two lovebirds for a few years. These two had me laughing almost to tears when Rebekah quickly informed me that Chris wants several children, which Chris chimed in saying he would be happy with four children! Rebekah seems to be on board for having multiple children and start a beautiful family, but she says she would be happy with two children & they'll have to take one day at a time. Rebekah: "Chris and I have done things a little backwards as we already have a house. I believe, in five years, we will be right here in Pearland, me still working at the job I love, (maybe part time) and Chris at a job he loves. We would have two beautiful children that we would raise the right way, by taking them to all the UT Longhorn and San Antonio Spurs games!! But in seriousness and in all the chaos that life may bring, I believe we will genuinely be able to say we are truly happy and still as much in love that day as we are today!" Chris: "In five years, I see ourselves having kids and enjoying our time together as a married couple. I also see our family strengthening our relationship with God and influencing others in a positive way." I love both of their responses, but I especially admire Chris' will to lead his new family with the guidance of the Lord and also wanting to influence other people in their daily life. This, right here, ladies & gentlemen, is truly what love is all about. I am truly overjoyed for you two being brought together & are going to be married in just a few short months. I truly hope that you love your engagement photos as much as I enjoyed taking them. Coming from a bride who been there and know how fast it goes by, cherish the next few months together as an engaged couple and do everything you can to slow down and enjoy being each others' fiances. You’ll only get to be fiancees for a short while longer, and then it’s husband and wife. You’ll be able to enjoy marriage for a lifetime. 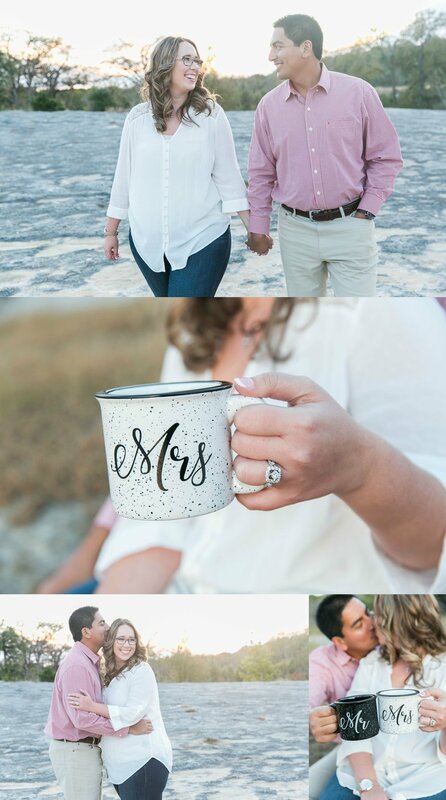 I'm honored to be the one to capture this special time for you - I have so many favorites from our time together during your Engagement Session & I am looking forward to creating new favorites at your wedding in April!